We're not into popularity contests at Castle in the Air, but if the products on our Online Shoppe were to have one, the crepe paper would certainly win. People love it for all the same reasons I do, including the color selection and the paper's ability to mimic natural objects such as bird feathers and flower petals. Not everyone knows about all the kinds of crepe paper we carry, or which ones are best for which projects, so here's a rundown of what we offer and some suggestions for what can be done with it. 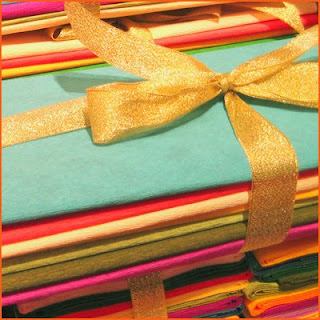 Fine Crepe: Fine crepe paper is just the right weight for making Mexican paper flowers. Cut into strips, it is excellent for rolling surprise balls. The paper is also great for small or delicate sculpture, such as the finer parts of a flower or a dress for a tiny doll. 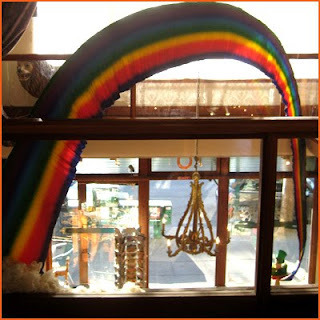 Of course, anything small is better big, in my opinion, which is why I love what John McRae made with several rolls of multicolored fine crepe--a fabulous rainbow! Doublette Crepe: With a relatively smooth finish and a different color on each side, the doublette crepe is wonderful for making flower petals. It is actually two sheets of fine crepe laminated together at the factory with an adhesive. The doublette crepe comes in single-sheet folds, each sheet being about a quarter of the size of a fine or florist crepe roll once it's unfolded. Florist Crepe: Thicker than the fine crepe, the florist crepe comes in two weights, although the difference between the 160 gram and 180 gram (per square meter) is almost imperceptible. 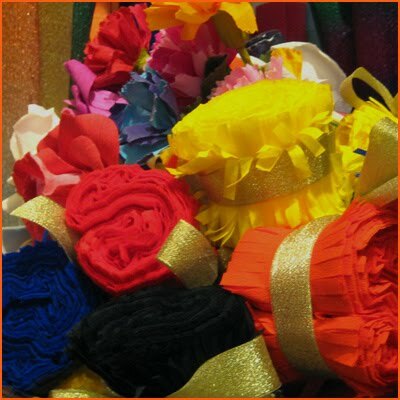 Florist crepe is a popular choice for people making crepe paper flowers, especially oversize ones. We also like to use it to dress our store mannequins, and we have several friends who've worn party clothes they've made from florist crepe. Noblesse Crepe: A thin crepe paper with all the benefits of our fine crepe papers, noblesse is painted a solid metallic color on one side and is white on the reverse. We carry several metallic shades of noblesse--gold, silver, copper--and a range of beautiful greens and other colors. Metallic Crepe: Our aluminum crepe, made with real metal laminated to paper, is often overlooked by crafters, but is great for incorporating a shiny flourish to your projects--beetle shells and butterfly wings, anyone? 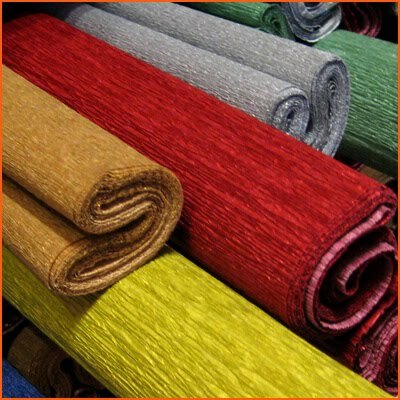 Our variegated aluminum crepe fades from one color to the next, and has about as much stretch as the florist. Crepe Paper Garlands: These rolls of fringed, colored streamers are holiday favorites, the obvious color combinations being orange and black for Halloween and green and red for Christmas. Short sections of the garlands can be cut and rolled tight to make stamens for the centers of paper flowers. Those are the facts, but nothing replaces the practical knowledge that comes from just getting your hands on some crafting materials and trying them out. Who knows? You might find a new way to use one of these kinds of crepe paper. If so, let us know! THRILLED with the post Karima! I'm so thankful you detailed the types of crepe at the Castle. I'm wanting your entire stock in every type and color, please. No? ok, I'll figure out what I must have and place my order! YUM! I ordered the doublette and the florist crepe paper by phone after finding The Castle via a google search. I used yellows, oranges, white and green to make many, many, many assorted flowers for centerpieces for my daughters wedding. They turned out great and thanks to The Castle for the quick and careful handling and shipping. I am enjoying receiving the update and class schedules even though I live in Florida. Thank you for the kind words!! It is always such a relief when we hear we've done something right! 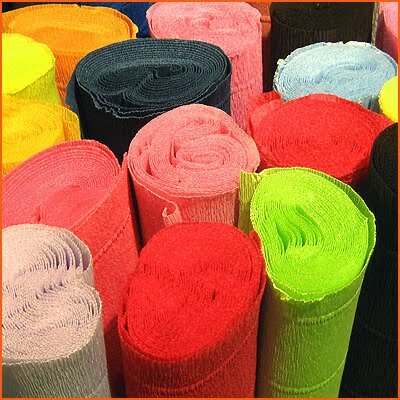 If at all possible, is there a way to get samples of all the colors & all the different types of crepe paper for my start up art business. Hello, Joi. Send us a self-addressed business envelope with $1.04 in postage and we'll stuff it with scraps for you.